For centuries criminals condemned to be executed at Tyburn were allowed a last drink at an ale house on their way to the gallows. Popped in after a trip to Wembley as the Metropolitan Bar next to Baker Street tube station had been closed by the police. Unfortunately there appeared to be only one draught beer on tap and prices started at £4.20 upwards. On the basis a pint of Shipyard American Pale Ale had cost me £2.49 earlier in the week in my local Wetherspoons I decided there were better places to spend my money. Very poor selection of guest beers on ranging from 4.8 to 6%. Bought a half pint, then bought a meal which had a 'compulsory' pint with it which I didn't really want at lunchtime especially given the strengths. The whole experience left me feeling more p***ed off rather than at satisfied customer. After the Moon Under Water, Lord Moon of the Mall, Wetherspoons Victoria Station and the Wishing Well, we arrived still looking for the 1 cider in the 'spoons cider festival I hadn't yet tried. Despite a good selection in here, I was still lacking. 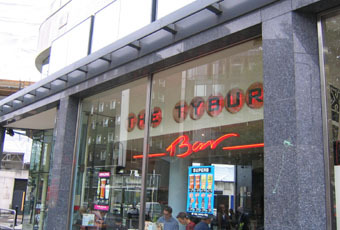 The Tyburn is a busy pub at the end of Oxford Street. So it attracts a good mix of customers. Ales were Burton Bridge Battle Brew, Sharps Doom Bar, Thornbridge Jaipur, Portobello VPA & Market Porter & Greene King IPA & Abbot. Ciders were Shepton Mallet Somerset Tree Shaker, Gwynt y Ddraig Welsh Gold, Waddlesgoose Lane Woodsprite & Spadger, Bottle Kicking Cider Company Cross Farm Perry, Cornish Orchards Farmhouse Cider, Thatchers Perry, Hogans Panking Pole, Sandfords Orchards Pear Shaped, Gwynt y Ddraig Farmhouse Pyder & DJ's Tempted? Summer Sweet Cider. Worth dropping in for one. Large corner ‘spoons at the start of Edgware Road just on the junction with Marble Arch. Usual ‘spoons with a slightly mixed crowd due to shoppers & day trippers. 7 ales on tap, one being an American IPA that obviously did well in the last beer festival that they have kept in on. Been in worse ‘spoons than this though the bar man that threw the phone across the bar as he was unhappy should be dealt with!